You GUYS. The baby stuff you can find on Etsy? Insane! When Alexa was born, Etsy wasn't as much of a thing. I mean, it was a "thing", but whoa, has it come a long way. I feel like the things I used to find on there in 2011 were super "arts and crafts"-y, if that makes sense? Now, I am up until all hours every night filling my shopping cart like, um, a parent who doesn't already have drawers full of hand me down finds from my first kid (and my friends' well-dressed baby girls) waiting to be used. I swore up and down I wasn't gonna buy a bunch of new clothes for Goldie- instead opting to mentally siphon my "baby fashion" budget into the "baby nurse" column. But seriously- check these shops out and just TRY to tell me you could resist? 1- Kennedy's Collection: Choose your font and color combo and customize any assortment of this shop's adorable hats, swaddle blankets, dresses and leggings. I discovered it too late to do this for myself but, if you still have a month or so before your due date, how amazing would it be to get a hat made with baby's name on it for that ubiquitous newborn Facebook photo that we all post from the hospital to announce baby's birth and, most exciting obviously, his or her name?! 2- Lulu & Roo: There is just something about a little kid in a sweatsuit that kills me every time. This shop has slouchy cool sweatpants, yes, but also not-even-the-slightest-bit-cheesy sweatshirts and sweat shorts (yes, you read that right, sweat shorts) in grey, pink, mint and peach hues. 3- Pink Posies Shop: Boho-chic newborn moccasins with their names stamped onto the soles? Yes please. 4- Lulu & Roo: Clearly I love this shop so much I had to post about it twice. Gold liquid leggings are one of those items best worn (ahem, ONLY worn) by kids of a certain age. I would say that 3 months to 8 years is probably the sweet spot for this style- so go for it while you can, right? Right. 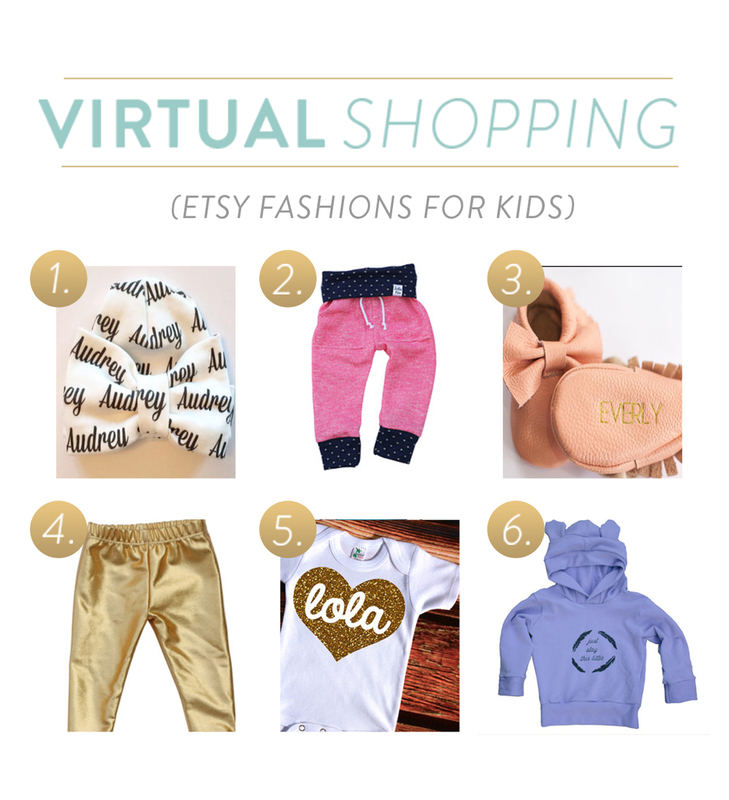 5- Haute Bellies: This shop has dozens of glittering gold tees and onesies that can be customized for everything from everyday wear to monthly milestones and big birthdays. I mean, my kid's name is Goldie so stocking up on this is kind of a given. 6- AnchoreDeep: Pretty much every single thing in this shop is something I wish I was cool enough to wear now. Baby harem pants and rompers in cool prints and camo, cozy hoodies featuring the phrase we all utter on the reg ("Stay This Little"), and just-the-right-size knotted head bands wraps that are the perfect anti-dote to those pink and purple oversized flower ones that used to be a girl's only option. Do you have a favorite Etsy shop for pint-sized fashions that I may have missed? Please share!